The recipe I'm sharing today actually came from the April issue of Food Network Magazine. It easy, fresh, and delicious! I had never tried watercress and decided to go ahead and add it as called for in the recipe and it was so good. I will definitely be buying it again. This would be perfect with grilled chicken or a white fish if you want to dress it up a little. You could also use it as a side dish or as serve it with pita bread, tortilla chips, or crusty bread as a main dish. It's great for the weekend and once spring hits, I always start craving fresh vegetables and salad! Heat garlic cloves, jalapeno and cumin seeds in a skillet with olive oil over low heat, 5 minutes. 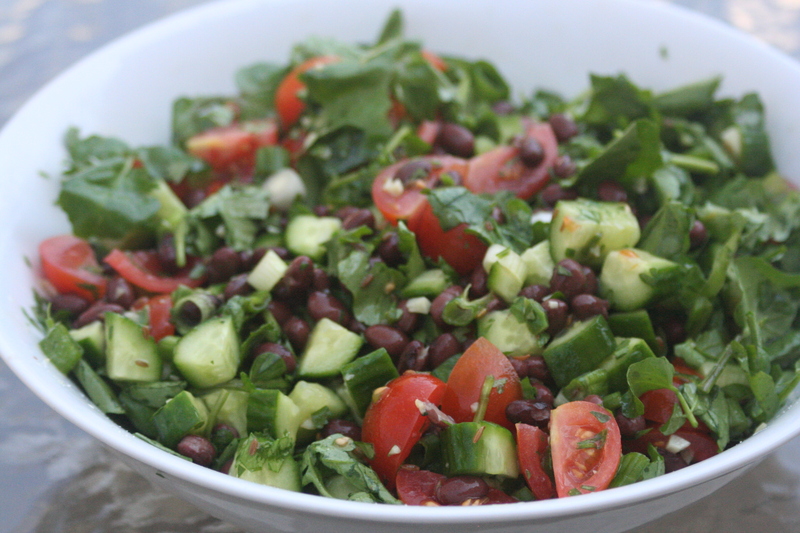 Toss a can of black beans, diced cucumber, tomatoes, scallions, lime juice and cilantro in a bowl. Add the hot garlic mixture to the beans. Season with salt and toss with watercress. Serves 4-6.